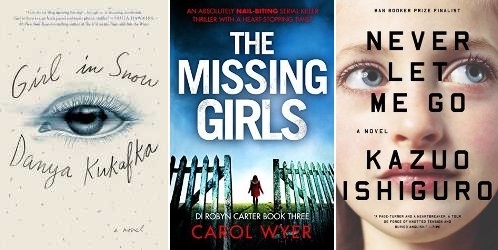 I’m finally continuing with The Missing Girls by Carol Wyer… It’s not that I didn’t want to read it (in fact it’s the other way around), but I had some other books I needed to read first and then I was behind with reviews and didn’t want to mix things up in the reviews by reading too many similar books. 😉 I’m also starting Monsters Of Men by Patrick Ness as soon as I finish The Missing Girls. I was going to read it last week but ended up reading a different Patrick Ness title instead after seeing the movie first on Netflix (which I never do and had to remedy that by reading the book immediately after). I’ve still posponed Never Let Me Go by Kazuo Ishiguro until I finish some other reads first because I just can’t get into the story right now. I really wanted to enjoy this story, but unfortunately I did stumble upon a few problems that made it harder for me to actually enjoy the reading experience. I’m not saying the writing is bad at all, but I do think it is something that either works for you or it doesn’t. Once I got used to it, Girl In Snow did turn out to be quite a fast read and there were some aspects and themes I really liked. Cameron is quite an interesting character both because of his memory loss and mental health issues. I can’t say I actually liked the characters and I wasn’t sure if some aspects of the plot and connections were completely credible, but the right person will probably love this story. I should have known already I would love this book after seeing so many glowing reviews and after positive experiences with some of his other stories, but WOW. This is hands down my new favorite Patrick Ness story and it will be hard for any other story to live up to this one. Between the brilliant prose, characters, powerful and emotional topics and perfect mix of reality and fantasy there just isn’t something I didn’t love about A Monster Calls. Read this book if you haven’t already. You won’t regret it. 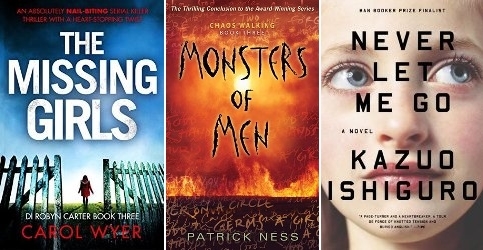 If you like fast-paced and twisty thrillers that read like a train, you will love The Kind Worth Killing. This story is packed with plot twists that will both surprise you and keep you guessing about what will happen next until the very end. The writing is excellent and only helps enjoying the story even more. The flashbacks to the past of Lily don’t distract from the main plot at all and only help to develop her character further. In short, definitely read this title if you haven’t already and like the genre. It’s just as good as everybody keeps promising in their raving reviews! While I had problems with the credibility of it all, I did very much enjoy reading Fierce Kingdom and I could really appreciate the refreshing plot and the fact that it isn’t just another psychological thriller. The focus on the bond between Joan and her son was interesting and added a whole different level to this story. Definitely one to keep in mind. I was actually invited to read this title a while back, and I was intrigued by both the cover and blurb. 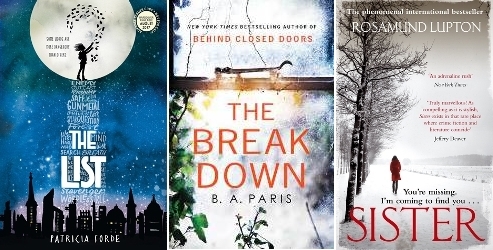 I was really looking forward to Girl In Snow, but unfortunately I can’t say I enjoyed it as much as I initially thought I would. This was actually the second time I picked up my copy, because somehow the first time I never made it past the first few pages. Because there is just something about the writing style that makes it quite hard to connect to it if you aren’t in the right mood, making it hard to stay focused on the story itself. I do have to say things went a lot better the second time around and after getting used to the writing style Girl In Snow turned out to be quite a fast read. That said, I can’t deny there was something about the way the story was written that didn’t manage to convince me completely. Because I’m pretty sure I wasn’t the only one who felt slightly confused by the what, who and how in the beginning. Things did get better when more information is given, although I do wish Girl In Snow would have been more focused on the actual plot and less on the different characters. Unfortunately I was never able to connect to the three main characters or their POVs used to tell the story and the victim Lucinda for me lacks developments to properly care about her. That said, I did appreciate the descriptions of Jade and Cameron and their issues; they seem quite realistic. 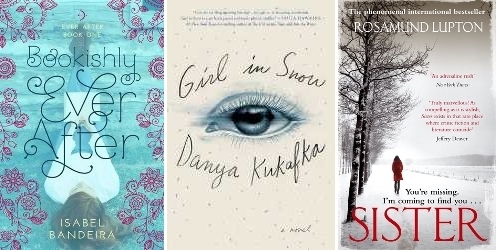 I wasn’t sure about the credibility in general though or the way everything was connected… But Girl In Snow is a fast read and has quite a few twists you probably won’t see coming. The memory loss of Cameron was an interesting touch as well. The teenage Lucinda Hayes is found murdered one winter morning in 2005 and it seems the whole town is affected by her death. Cameron, Jade and Russ are each somehow connected to her life or the aftermath of Lucinda’s death and will have to confront their secrets to find out the truth about what happened to Lucinda… Because things are not what they seem and if they don’t try to face their problems, the truth may never come out. I’m actually reading a short story called Americosis Vol. 4 by Haydn Wilks as well (although I’ll probably have finished it by now), but as the cover is basically a swearword I’ve decided not to show it on my blog (it’s bad enough it’ll show up on my Goodreads timeline xD) These volumes have been crazy rides so far and I don’t think this one will be any different. I’m also quite far into The Lost Book Of The Grail by Charlie Lovett, which is proving to be a goldmine for bookish quotes and references. The pace is superslow though and it’s taking me longer than expected to read it… I’m only a few pages into The Girls In The Water by Victoria Jenkins, but I’ll read it next since I’ve heard good things about it. And I made it to page 66 or chapter 4 of Sister by Rosamund Lupton (which I’m actually reading in Dutch). I’m not a fan of the story so far, although I’m not sure if it’s the language barrier or the book itself. I’m going to be honest and say I don’t think I would have picked up this story if this wouldn’t have turned up on my Netgalley shelf. I’m not a big fan of (cheesy) contemporary romance in the first place and Bookishly Ever After makes it definitely VERY easy to overdose on the high school cliches and romance tropes incorporated into the story. I’ve tried really hard to see beyond the cliches, but found myself too frustrated to be able to continue and finish the story. 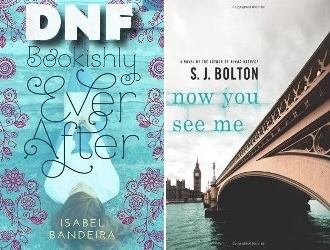 And I tell you, it makes me very sad to call Bookishly Ever After my second DNF this year! Part of the problem is definitely me though and I can see why fans of the genre would be able to enjoy it a lot better. Oh well, I guess we can’t like them all, can we? First of all I have to say that this book has probably suffered from the fact that I’m currently sort of in a slump and I can’t seem to love any book right now. Because there is definitely a lot to love in this first book of the Lacey Flint series. This book had me at serial killer and Jack The Ripper and I love how this old case plays such a big role in the story. It surely shows just how well the author has investigated this part! It’s a well written thriller with a lot of twists that will keep you guessing… I do have to say I never really warmed up to Lacey and the whole bantering between Joesbury and her started to get annoying. Also, the whole mystery around Lacey’s character and the twists and misinformation in the final part of the story sort of had the opposite effect on me and I mostly felt confused and frustrated instead of on the edge of my seat. I’m definitely still going to read the sequel though! 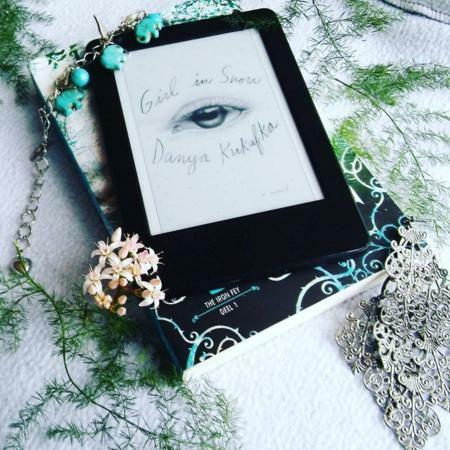 I actually started Girl In Snow by Danya Kukafka before, but after trying a few pages I just couldn’t get into the writing style. I decided to put it on hold to see if it just wasn’t the right time for it… And read some other titles first. Probably next up will be The Ask And The Answer by Patrick Ness as part of the promise to myself to start reading my own books. I also want to read The Lying Game by Ruth Ware, which is actually an ARC but a title I’m really excited about. My newest TBR jar pick is still Beautiful Broken Things by Sara Barnard, which I’m hoping to read some time soon. The List is without doubt based on a very fascinating and original concept I would easily have given the highest rating for. The language elements are very interesting as well and this was definitely my favorite element of the story. That said, it did take me way longer than expected to read this Middle Grade story and I had difficulties connecting to both the writing style and the characters. I ended up having mixed thoughts about The List, but I guess the story can go either way for you. I’m aware that The Breakdown has been receiving a lot of mixed reviews, but I personally had a really positive experience reading this psychological thriller. Then again I’m a sucker for any story with an amnesia/dementia angle and I found this element very well executed in The Breakdown. I didn’t particularly like Cass or the other characters, but the character development and growing forgetfulness and paranoia was brilliantly executed. In short I would definitely recommend giving this one a chance if you like the genre. First of all I have to say that Confess by no means is a bad read, and I’m probably partly to blame for this story and me not being a right match. The writing style is just so readable and I do love the idea of the confessions turned into art and the way confessions are incorporated into the story itself. Confess isn’t just another sappy romance story and has a few very dark themes, but in the end it was the instalove overdose and inability to tolerate the main characters that ruined the reading experience for me. Oh well, I guess we can’t like them all… And what I said before is true: Colleen Hoover is always able to provoke very strong reactions with her stories whether they are positive or negative. And that is always a good sign. Wow. Just WOW. I will need time to cool off, because this thriller has been one hell of a ride… Stillhouse Lake is hands down one of the best thrillers I’ve read this year and just so damn intense! Highly creepy serial killer: check. Intriguing plot and plot twists: check. Constant suspense and feeling something is off: check. Brilliant writing style that keeps you on the edge of your seat: check. Inability to trust any character: check. Being sure you figured it all out and finding out you’re wrong over and over again: check. Very realistic character development: check. Do I have to go on? Dark, twisted, messed up and oh so good… I’m going to keep my fingers crossed I will be able to squeeze out a somewhat more coherent review by tomorrow. 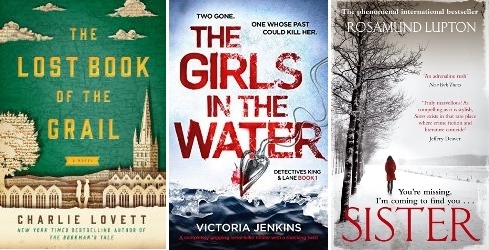 I’m getting closer towards my goal of finishing most of the ARCs on my Netgalley shelf, which means only one NG title on here: The Girls In The Water by Victoria Jenkins. I’ve heard lots of great things about that one! I also want to read The Secret Of Heaven by Felix Alexander, a Reading Alley ARC that will help me change genres a bit. And…. *drumroll* I’m finally going to read Now You See Me by S.J. Bolton! I’ve been posponing it for way too long now, so fingers crossed I will be able to move it to my currentlyreading pile by next week. My newest TBR jar pick is still Beautiful Broken Things by Sara Barnard, which I’m hoping to read before the end of this month.